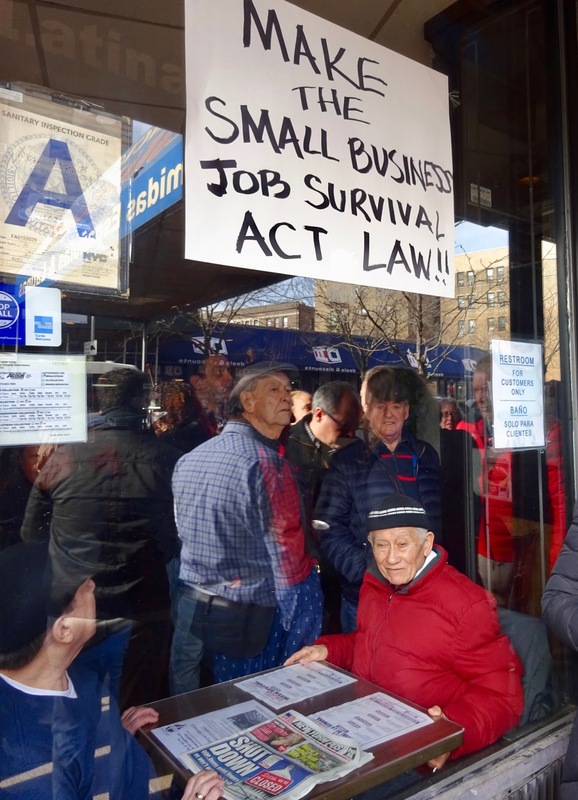 Yesterday, local organizers, politicians, and community members rallied to save Galicia restaurant on Broadway near 172nd Street in Washington Heights. After 30 years in business, they're being denied a lease renewal by the Edelsteins of Edel Family Management, owners of several buildings in the area. As always, the restaurant was full of faithful customers, dining on delicious home-style meals. Hand-lettered signs in the windows read "Save Galicia" and "Make the Small Business Job[s] Survival Act Law!!" A large crowd of New Yorkers gathered on the sidewalk. Unlike at last week's rally for Coogan's bar and restaurant a few blocks south, the phalanx of major news cameras was not present. (NBC4 got some shots.) I saw no reporters from major papers. (Patch was there.) Congressman Adriano Espaillat, Public Advocate Letitia James, and City Comptroller Scott Stringer did not appear. But dozens of others did--and they were passionate about small businesses in Washington Heights. Rally organizer Lena Melendez spoke of the "favorite and authentic" restaurant, a survivor from the difficult days of the 1980s. She introduced Manhattan Borough President Gale Brewer, who promised to "Do what we can to pressure the Edelstein family to come to the table" and negotiate a fair lease renewal. "We expect our small businesses to be treated fairly," Brewer said. "Let's keep the pressure going." 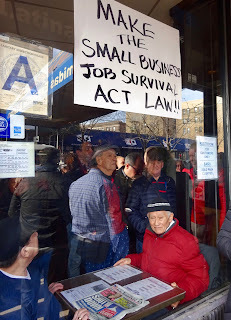 David Eisenbach, former candidate for Public Advocate, made a push for the Small Business Jobs Survival Act (SBJSA). "We can't keep counting on politicians to save the day," he said. "This can't be done on a case by case basis." We need legislation, he argued, "to level the playing field." He called for a full public hearing and a City Council vote on the SBJSA. "Let democracy happen!" Peter Walsh, co-owner of Coogan's, began, "As a child of Irish immigrants, I was saved by new immigrants--the Dominicans of Dominican Heights!" His bar has been sustained by Latinx locals--and was recently saved from a massive rent hike. He recalled the days of high crime, when Galicia opened and survived. And he spoke of gentrification's power to displace. "Now that the neighborhood has become attractive to everyone else, who do they want to kick out? The pathfinders. The Dominican immigrants who built this neighborhood." Someone from the crowd shouted, "We are what's right with America!" For well over an hour, several community members got up to speak, in English and in Spanish. City Council Member Ydanis Rodriguez ended his speech with a chant of "Si, se puede!" Yes, we can. How can you help? 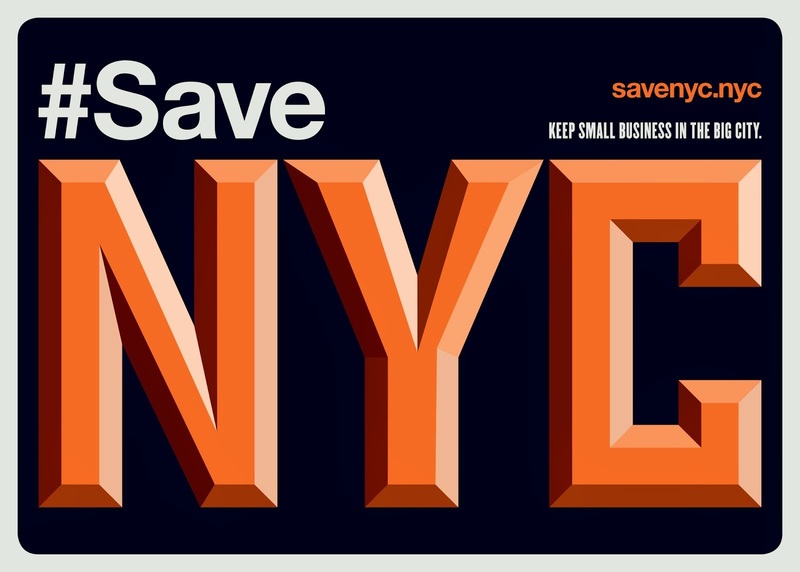 Write to City Council Speaker Corey Johnson and tell him to bring the SBJSA to a vote. Write to your City Council members and tell them to pass the SBJSA. You can find their contact info here -- and sample emails here and here. While this is heartening to see, in the end it comes to nothing. The developer will jack up the rent and do what they like. The Heights will get a Duane Reade or Chipotle.